An example of a Hoth Officer is Toryn Farr, who was a Human female who served as a communications officer in the Rebel Alliance during the Galactic Civil War. 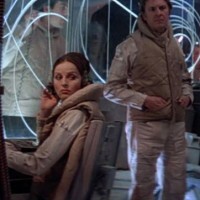 Three years after the Battle of Yavin, she was stationed in Echo Base on the planet Hoth and coordinated the defense and evacuation of the planet from the control room. She was one of the last officers to leave Hoth, escaping on the final transport Bright Hope. Grey/light blue quilted fabric boots. Flat soled without straps or embellishments. Boot height should be at least over the calf, just short of knee height. Medium grey jumpsuit of a medium weight fabric with long sleeves that end in a cuff. The jumpsuit has a mandarin collar with a flap that goes from right to left. There must be a patch pocket on each upper thigh, a code cylinder pocket on the upper left arm, and an empty comm pad pocket on the lower left arm. 3. Screen accurate code cylinders/arm tools in upper arm pocket. 4. Screen accurate cloth insignia sewn onto upper right arm of jumpsuit, consisting of white cloth with black grid of 9 squares with no outside border, with an orange and red rectangle painted within two of the squares and black ‘crosshair-style’ markings in other two squares. Beige or tan sleeveless vest with a puffy, padded collar, front pockets, and a rectangular, open rank badge pocket on the front left chest. The bottom two-thirds of the vest should be quilted to match reference photos. The vest has no fastenings. Screen accurate rank badge on vest, in the left chest pocket. Earphones- vintage radio/military/aviation headphones, must be screen accurate.